This document describes the contexts in which media can be downloaded within Kaltura MediaSpace. There are four places within Kaltura MediaSpace in which media can be downloaded. Where you can download depends on your relationship with the media. If you are an owner or co-editor, you can download in more places than when you are a viewer. Navigate to the media page for the item you would like to download. This can be done by going to your "My Media" and clicking on either the name or thumbnail of the media item. Once on the media page, you should see your media. Below the player on the right side, you should see the "Actions" button. Click it. Then click "Edit". If you do not see the "Edit" option, you are not the owner of the media and/or do not have co-editor permissions. You can request co-editor permissions by contacting the media owner. You should now be on the "Edit Media" page. The player on this page has a download button enabled. Once clicked, it will provide you with the original, uploaded media file. Follow steps one and two under Download Original File to get to the "Edit Media" page. Select the download options you would like to provide to your viewers by clicking the check box next to each of the available formats. After you are satisfied with your selections, click the "Save" button. The message "The information was saved successfully" will appear under the "Save" button in a green dialog box. To verify that your viewers will be provided with a "Download" button, navigate to the media page, by clicking the "Go To Media" link located next to the "Save" button. Once on the media page, the "Download" button appears under the media player between the "Details" and "Share" buttons. If you do not direct your viewers to media pages within Kaltura MediaSpace but instead use an external site (e.g. a learning management system, departmental website, KnowledgeBase document, etc. ), you can also provide your viewers with the option to download your media. Navigate to the media page for the item you would like to embed in an external site. This can be done by going to your "My Media" and clicking on either the name or thumbnail of the media item. Click the "Share" button located under the media player. 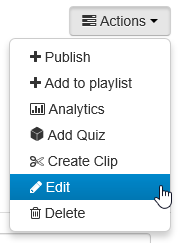 Click the "Embed" tab located between the "Link to Media Page" and "oEmbed" tabs. You can then copy the "Embed Code" and paste it in your own site or LMS. For information on how to use embed code in your site or LMS, please see the documentation for your site or LMS. Bulk downloads of owned media can be performed by a System Admin. To request a Bulk Download fill out this form located on the Learn@UW page.